Maury Wills spent 8 1/2 seasons in the minors before getting a call to the big leagues. Harsh sunshine beat down on the Los Angeles Coliseum floor. Two men, drenched in sweat by the end, practiced baseball drills on a day when L.A. temperatures soared to 100 degrees. Dodgers coach Pete Reiser, the former Brooklyn phenom, pitched balls for hours to 27-year-old shortstop Maury Wills. Reiser and Wills kept this going for a month. It was the spring of 1960. “Overnight.” What did Wills think about that? … Overnight? … Ever? The son of a Baptist minister and one of 13 children, Maurice Morning Wills grew up in Washington, D.C. Undersized as an athlete, he didn’t care. That just made him work harder. He played football, basketball and baseball at Cardozo High School. The Brooklyn Dodgers signed Wills to a contract in the fall of 1950 and assigned him to the Hornell, New York, Dodgers of the Class D Pennsylvania-Ontario-New York League. He was a long way from the majors. Wills batted about .280 and stole 54 bases in his rookie season as a professional baseball player. The next season, he hit .300 and stole 54 bases again, this time for the Santa Barbara, California, Dodgers of the California League. “The Dodgers had tabbed me as a definite major-league prospect,” Willis wrote in his 1963 book It Pays to Steal, co-written with Steve Gardner. The Dodgers promoted Wills to the Class A Pueblo, Colorado, Dodgers of the Western League and, the following year, to the AA Ft. Worth, Texas, Cats in the Texas League. The prospect became suspect in tumbleweed country. Halfway through the season, his batting average stood at just .220, and he began spending more and more time on the bench. Those struggles earned Wills a trip back to Pueblo. He hit .302 and stole 34 bases in his return engagement. Next stop, Washington state. First, Wills reported to the Seattle Rainers of the Pacific Coast League, and then to the Spokane, Indians, also of the PCL. Bobby Bragan managed Spokane. He played nine years in the majors (1940-48), for the Philadelphia Phillies and Brooklyn Dodgers. The infielder-catcher was known for clashing with Dodgers executive Branch Rickey when Rickey promoted Jackie Robinson and broke baseball’s color barrier. Bragan, though, quickly changed his mind about Robinson. “After just one road trip, I saw the quality of Jackie the man and the player,” Bragan told mlb.com in 2005. Every day, Bragan helped Wills. He also suggested that the natural right-handed batter turn himself into a switch hitter. The idea, of course, was that the speedy player would be that much closer to first base if he could hit left-handed. Initially, Wills brushed off the idea. “I’m too old to learn,” said Wills, who was 25. But, Wills did OK. He hit .260 in 83 games and fielded well enough at shortstop. The following season, though, he was barely above .200 after several weeks of play. Sometimes, Dodgers manager Walt Alston pinch hit for Wills as early as the fourth inning. “What am I going to do?” Wills asked Reiser after one of many disappointing days. Reiser had once been a hot prospect himself. Coaches and writers predicted that the St. Louis native would turn into a superstar. He played hard and, sometimes, recklessly. He crashed into walls and couldn’t stay healthy. Reiser also missed three prime years due to his service in World War II. Thought of as a future Hall of Famer by some, Reiser played 10 seasons in the big leagues and in only 861 games. Hired by the Dodgers as a coach, Reiser made his name as an enthusiastic teacher. Wills listened. By season’s end in 1960, he had hiked his average to .295 and led the National League in stolen bases with 52. He also topped the N.L. in steals the next year, and in 1962, he enjoyed his career year. Wills batted .299, collected 208 hits, and scored 130 runs. He also broke a major-league record with 104 steals, breaking Ty Cobb’s mark of 96 set in 1915. Writers awarded Wills with an MVP trophy. The lean, lithe shortstop shared the credit with his teachers. “I’ll never forget what Pete Reiser and Bobby Bragan did for me,” Wills said, probably more than once. Wills spent 14 seasons (1959-72) in the majors, 12 of them (59-66, 69-72) with the Dodgers. He batted .281 lifetime and collected 2,134 hits. Most famously, he swiped 586 bases and led the league in that category six times. Following his retirement, Wills spent some time as a broadcaster for NBC. He served a mostly disastrous stint as manager of the Seattle Mariners (1980-81) and battled drug addiction for years. Former Dodgers pitcher and alcoholic Don Newcombe helped Wills get sober in 1989. Since then, Wills has spent much of his time teaching Dodgers players about the art of base running. He also wrote a frank autobiography, On the Run: The Never Dull and Often Shocking Life of Maury Wills. 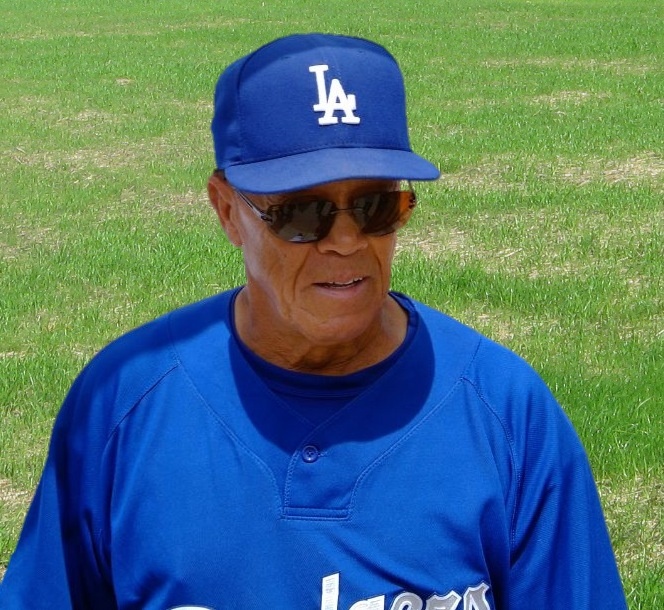 So, if Luis Aparicio Is in, Should Maury Wills be in, too? Go! Go! Go, Maury! Go! Maury Wills was the N.L. MVP in 1962. Dodger fans chanted this encouragement to Maury Wills in the 1960s. And, more often enough, Wills went. The shortstop led the league in stolen bases six times, every year from 1960 through 1965. He stole 104 bases in 1962, breaking a record that Ty Cobb had set in 1915. Wills retired with 586 thefts and an MVP award in that history-making season of ’62. Now, Wills may be going into the Hall of Fame. The Golden Era candidate needs 75 percent of the vote. The Maury Wills story is one of perseverance, followed by high speed, followed by addiction and, finally, recovery. A slender 5-foot-11, Wills battled his way just to get to the Dodgers. The native of Washington, D.C., rode the minor-league buses for eight seasons, learning how to switch-hit and use his speed. Finally, he gained the starting shortstop job in L.A. in 1960. As the MVP in ’62, Wills batted .299 and scored 130 runs (6.0 WAR). Catchers nailed him just 13 times in 117 attempts. Sliding on the hard dirt made Wills famous; it also tore up his legs. He cut down his steals to 40 in 1963 and 53 in ’65. The speedster rebounded with 94 in 1966 and finished third in the MVP voting. That year, though, catchers threw him out 31 times. Wills played on three pennant winners and two World Series champion teams. He left L.A. after the 1966 season for Pittsburgh. Following two seasons with the Pirates, he spent the first few unhappy months of 1969 with the Montreal Expos. Los Angeles made a trade for him, and Wills spent his final 2 ½ seasons back with the Dodgers. Luis Aparicio might be the best comp for Wills. The Hall of Famer from Venezuela was a speedy shortstop who played in roughly the same era. Aparicio led the league in steals nine times, but he topped out with 57 thefts, far below Wills’ top figure. Aparicio also won the Rookie of the Year Award in 1956. He finished second in the A.L. MVP voting in 1959. The writers voted him into Cooperstown in 1984 in his sixth year on the ballot. Now, we must get into Wills’ disastrous stint as manager of the Seattle Mariners. Wills skippered the Mariners for parts of the 1981 and ’82 seasons. He compiled a 26-56 won-loss record, a .woeful 317 percentage. And that’s the good news. Once, he called for a relief pitcher; unfortunately, no one was warming up in the bullpen. Another time, he took 10 minutes to decide on a pinch-hitter. And, once, he left mid-game to fly to California. Of course, Wills fought some off-field issues. He wrote about his cocaine and alcohol abuse in the book On the Run: The Never Dull and Often Shocking Life of Maury Wills. He has credited his wife, Angela George, and former Dodger great Don Newcombe for getting him sober. Now, Wills spends much of his time at Dodger Stadium during the season. He still helps players with their bunting and base running. He also does community relations work for the team. Will he make it to the Hall of Fame? I have no idea. What he has done in turning around his life, though, might be his greatest achievement.